Bake a batch of easy holiday Cranberry Orange Scones with Winter Spiced Glaze to gift to neighbors or enjoy as an afternoon snack. This easy freezer-friendly scone recipe calls for simple ingredients, and offers a delicate crumb finish. 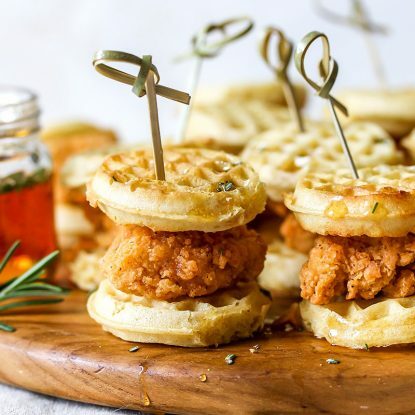 The holidays are the best time of year to indulge, so make your choices count by picking perfect recipes to enjoy. 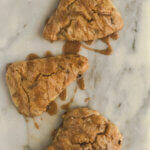 This easy scone recipe comes together quickly, making it a fun afternoon project with your kids. The warm winter-spiced glaze brings the best flavors of the season to your plate, making it a natural pairing for an afternoon tea or coffee date. 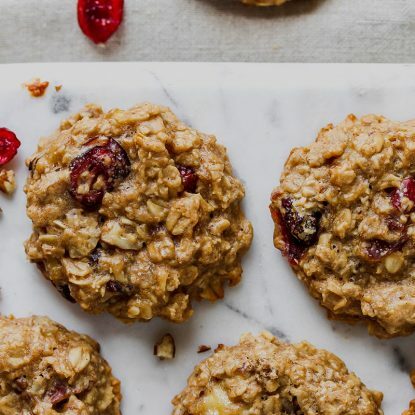 For best results, start with fresh, cold butter, then make them your own by swapping in different nuts and dried fruits until you find your signature scone. Butter is an important part of this recipe, so make sure you are using fresh, cold butter. Substitute pecans for the walnuts if you like, and tart cherries or apricots for the cranberries. Adjust the spice in the glaze if you want a little less or more a little more flavor. Store scones in a Ziploc bag or container lined with a paper towel for up to three days. Toast or warm in the microwave if eating the day after you’ve made them. Alternately, you can freeze unbaked scones for up to three months in a sealed container or freezer bag. 1/2 cup nuts roughly chopped such as pecans or walnuts. In a food processor, combine 2 cups flour, 2 tablespoons sugar, baking powder, and salt. Add the butter and orange zest and pulse until the butter is very fine, about the size of peas. If you do not have a food processor, you can do this step with your hands, cutting the butter into the flour in small pieces with forks or your fingers. Combine lightly beaten eggs and heavy cream in a liquid measuring cup. In short pulses, slowly pour egg and cream mixture into butter and flour mixture. If doing it by hand, gently incorporate with a rubber spatula. Mix additional 1 tablespoon of flour with cranberries and add this to dough, along with chopped nuts. Dough will appear lumpy. On a well-floured surface, pat the dough into a ball. Flour both your hands and pat the dough into an even and flat circle, about 1 inch thick. Using a large knife, cut the dough into 8 wedges. 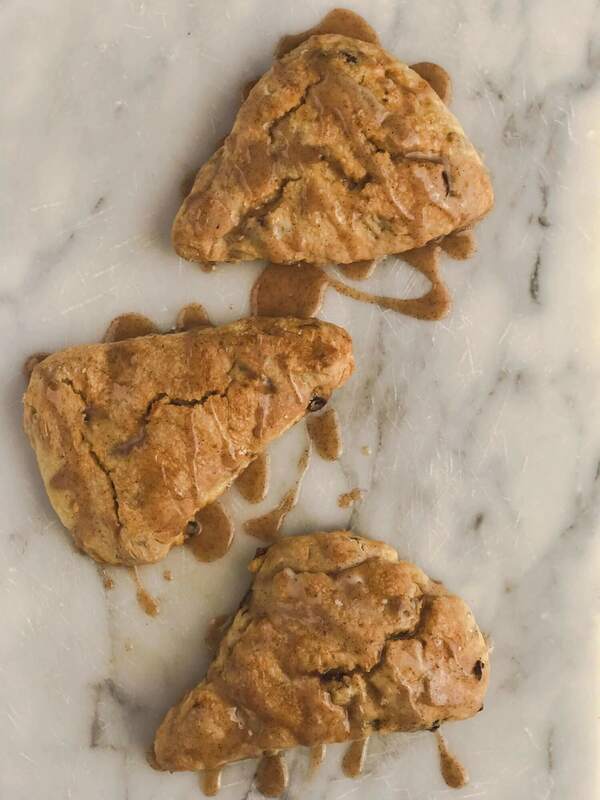 Place scone wedges on a baking pan lined with parchment paper. Lightly brush tops with heavy cream. Bake for 20 minutes, until the tops are golden brown. The scones should be firm to the touch. While scones are cooling, whisk together powdered sugar, orange juice, spice blend and vanilla until smooth. 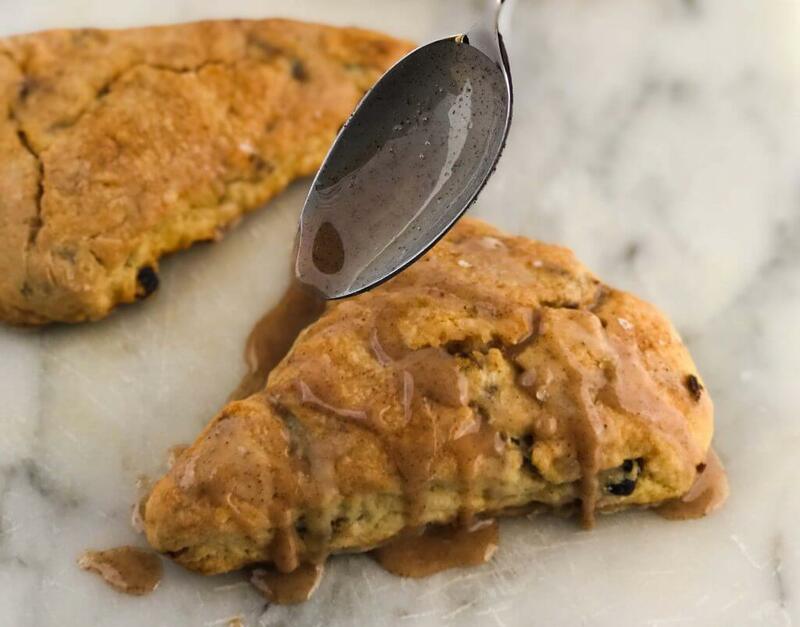 Once scones are completely cooled, use a whisk or spoon to drizzle glaze over scones. Bake a batch of easy holiday scones to gift to neighbors or enjoy as an afternoon snack. This easy freezer-friendly scone recipe calls for simple ingredients, and offers a delicate crumb finish.